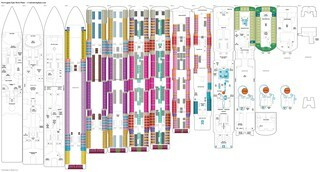 * Balcony cabins 8004 to 8018 on the port side and 8005 to 8019 on the starboard side are in hull style balconies. This means that instead of a see through glass railing, the balcony has a metal railing which will restrict the view when sitting down on the balcony. * Balcony cabins 8020 to 8046 and 8076 to 8110 on the port side and 8021 to 8047 and 8077 to 8111 on the starboard side are open to view by the cabins above. This also means less protection in case of rain, but more sunshine. * All cabins on this deck are above public areas on the deck below and may experience some noise issues from those areas. 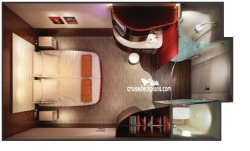 This is more likely in the case of the forward cabins on this deck which are above the Bliss Lounge. 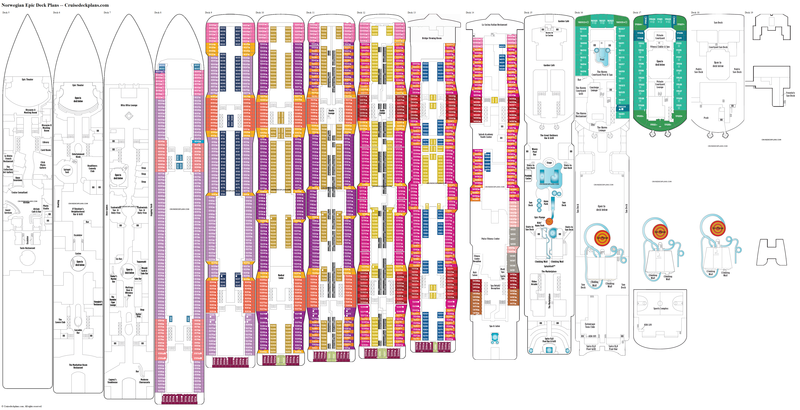 * Except for cabins 8026 and forward on the port side and 8027 and forward on the starboard side plus cabins 8190 to aft on the port side and 8191 to aft on the starboard side, most cabins on the port side and starboard side of the ship will look down on the top of the lifeboats which extend out from the deck below.